The first international break of the new season finally concluded as the players returned to their respective clubs. Premier League's game week five resumed on Saturday with Tottenham and Liverpool taking on each other in the first game as early kickoff. Chelsea looked to continue their perfect start to the season and make it five wins in a row as they welcomed Cardiff City at Stamford Bridge on Saturday, September 15. Chelsea along with Liverpool and Watford were the only teams left with a 100% record in the premier league. In the early kickoff, Liverpool had already made it five wins in a row by beating Tottenham and pressure was on Chelsea to keep pace with the Merseyside club. Cardiff City did not have the best of starts to the season and were yet to register a single win in the league. Neil Warnock, Cardiff City head coach hinted in the pre-match press conference that contrary to their style of play and their team's reputation as a defensive force, they would look to attack the West London side on their own turf which raised a few eyebrows. Maurizio Sarri, on the other hand, was looking to capitalize on the good start to his reign at Chelsea with another comfortable win as Chelsea await a congested schedule in September and a win would give the Blues good momentum to see through the next phase of the season. The major talking point for Chelsea was the exclusion of Alvaro Morata from the starting lineup and being replaced by French striker Olivier Giroud. The French striker repaid Sarri's faith with an impressive display. The second half saw Chelsea score another couple of goals with Eden Hazard completed his hattrick by scoring an 80th-minute penalty and Willian rounded up the scoring with a sensational curler within three minutes of the previous goal. Second half substitutes Ross Barkley and Willian looked sharp and Davide Zappacosta also made an appearance off the bench. 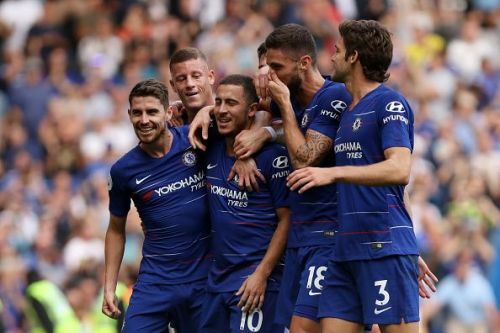 Overall it was a comfortable 4-1 win for the Blues and Chelsea continue a stellar start to life under their new Italian manager Maurizio Sarri.